Most wrapped candy is displayed in bulk to allow customers to grab a handful. Once their bag is full it is weighed and priced accordingly. Little effort is required to replenish these bulk bins! The US Department of Health states that unwrapped candy should be stored and dispensed from acrylic containers. These bins not only help to keep your candy fresher longer, but also stack together neatly for an impressive visual display and efficient use of space. Like a standing army, an array of gravity dispensers stacked side-by-side is an impressive sight. These fixtures provide the cleanest way to dispense while minimizing spillage and waste. These countertop displays in wire or wicker (or combinations of the two) offer the right amount of space for impulse sales. Place a tray or basket at the checkout counter to drum up sales. Floor displays in wood, wire, and cardboard hold a large number of items. 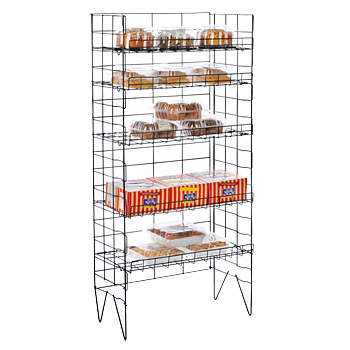 Their ideal application is for the display of baked goods or gift boxes. Little do people realize that candy is a recession-proof commodity. However, in spite of any economic condition, the desire for simple comforts never leaves. There are the so-called sin industries (alcohol and tobacco) available to adults only, but we think pretty much everyone can get behind a bar of chocolate or a bowl of jelly beans. For just a dollar or two, candy packs a load of sweetness into your daily schedule. From small mom-and-pop shops to national suppliers, the industry also does an excellent job of fueling the economy. An interesting statistic is its large 1:7 multiplier effect. For every employee position that is created, seven more jobs are supported throughout the affiliated industry that make up the candy's ingredients, manufacturing, delivery, and fulfillment. That is awesome. Dump Bins are typically floor-standing fixtures with large open containers that hold a wealth of items. Often found centrally located to allow shoppers to weave amongst them, these bins usually feature false bottoms to give the appearance of, let's say, an entirely full wooden barrel. This illusion of a 'ton' of candy in one place adds to the overall look and feel of your shop. 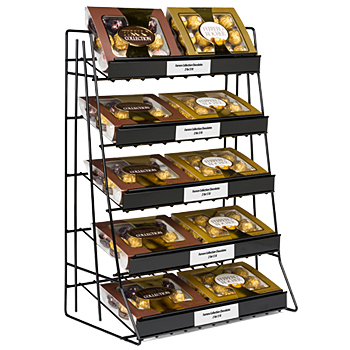 Designed for individually wrapped candy, the displays provide self-service while remaining ridiculously easy to replenish with new stock. Clear Acrylic Containers are the workhorse of the candy shop. Merchants stack multitudes of these bins against the wall to attract the attention of customers. Since candy comes in all sorts of varieties, this plays to the proprietor's advantage by enticing shoppers with "The Wall of Color". Since the US Department of Health requires unwrapped candy be stored in plastic containers, special lift-open lids provide the shopper with access. Candy scoops come standard with some models and are attached to the side of the bin with a bungee cord. Stackable models allow for some creative displaying which in turn elevates the impressiveness of seeing so much candy in one place. Here's an important objective to meet: try to cater to consumer niches by offering regional specialties or those candies that elicit an emotional or nostalgic response. Gravity Dispensers are other tools of the candy trade and a lot of fun to use. 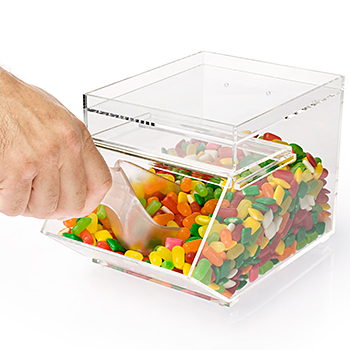 These containers are ideally suited for purchasing an assortment of candy by weight. 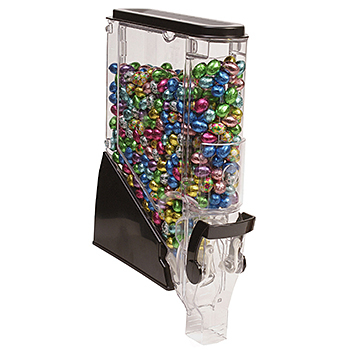 The dispensers feature portion-control paddles that limit the amount of candy with a turn of the wheel. No-touch dispensing equates with fewer spills and waste. Normally the containers are filled with unwrapped candy, and best of all since the containers are transparent, you will see which candy needs replenishing. The number one travesty in the store is out-of-stock candy! Impulse Buy Displays are extremely important to the candy store proprietor. Candy, by its very nature, is an impulse buy so the best locations to place them are at high-traffic areas. Countertop fixtures placed near the register can be as simple as a wicker tray or a small multi-tiered rack with two or three separate display areas. But don't only think about impulse sales in this way, consider another sales avenue using countertop displays. Always push for new products. Placing them on their own display table at your store's entrance is a great way to highlight new arrivals and entice customers into making a purchase. Floor Stands and Shelves are ubiquitous in any retail environment. Not only do these hard working fixtures display the most amount of merchandise, but also provide the most display flexibility when it comes to marketing. Besides being the backbone of your store layout, stands and shelves can help push seasonal products or promotional tie-ins. With a little bit of decoration, Halloween morphs into Thanksgiving, which abruptly switches to Christmas, which jumps over to Valentine's Day, then melts into Easter, Mothers Day, Father's Day....you get the picture. A year's worth of marketing your candy to willing customers is a daily undertaking. 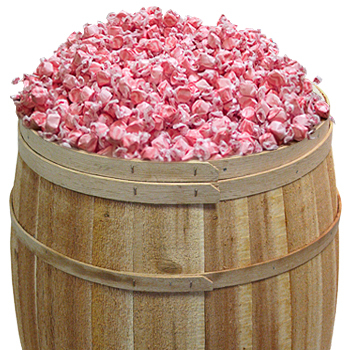 Even obscure candy holidays (National Taffy Day?) can help boost your sales during slow periods. A growing trend to watch for is increasing customer price awareness. Customers are always on the lookout for larger quantities with lower prices, with gift boxed candy assortments topping the list. While this comes at no surprise, what is surprising is candy made with healthier ingredients. This health-conscious trend includes chocolate-covered super fruits (blueberries, cranberries, cherries, and acai berries), vitamin C fortified gummy bears, gourmet nut bars, and combinations of strange and interesting flavors like tea infused chocolate. Candy's future is bright!